ffordable, single server backup software for Windows. NovaBACKUP Server offers reliable data protection for standalone Windows Server systems with flexible data protection, offering full, incremental and differential backups, plus disaster recovery image backups for complete system restores in the event of a disaster. With true Universal Restore, you can restore your entire system to a completely new system, even with dissimilar hardware quickly and easily using a bootable media device. With easy setup and simple backup wizards, anyone can implement professional, data backup and retention procedures in minutes. With real-time reporting, you are in control of your backups at all times. Get daily, weekly or monthly backup summary reports sent via email with simple one-step email setup. Backup your data to hard drives, thumb drives, NAS devices, FTP, tape libraries, RDX drives, online, or to file sharing sites like Dropbox or OneDrive for more secure cloud backup. With patented file restoration technology, you can find and restore any file, including historical versions of files, regardless or when of where the files were backed up. NovaBACKUP remembers which storage device you stored a file and tells you, so you can quickly find and restore the file or files you need. You also have the flexibility to restore files from a specific backup or a specific time range of backups. Streamlined for efficiency, NovaBACKUP offers one of the smallest and fastest backup software installations on the market. 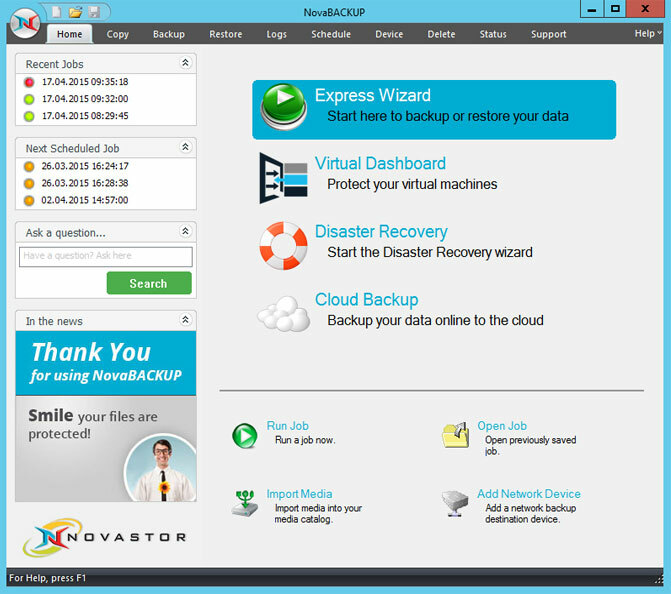 With rock-solid stability, award-winning backup technology, military-grade data encryption, industry-leading technical support, custom installations and setup assistance, NovaBACKUP is a top backup software solution for small businesses running Windows Server 2012 R2, 2012, 2008 and 2003. NovaBACKUP is backup for the rest of us. Try it today. Our download comes as a fully functioning FREE trial.